This was picked up by the Star. Look, I know that I can’t draw a straight line between this cowardly act and the teams behind Polievre and Baird, but c’mon… even if the perps aren’t card-carrying members of the CPC, they are almost certainly supporters. 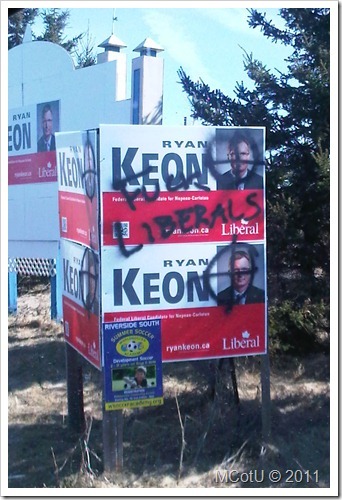 Only Keon’s signs were targeted with the graffiti – NDP and GPC signs were knocked down… but the Keon signs were the only ones targeted with this “message”. This happens in every election. But it always seems to be the Liberal signs that are hit. If someone can prove otherwise, I will stand corrected. This stuff – and the language on the sign – is more in line with the lunatic fringes CPC supporters. Can anyone really imagine a “granola chewing, tree hugging” Dipper doing this? The Greens??? That’s just laughable! Anyhow, I’ll back down a little from any direct blame… but not completely. One thing is for sure – this was not the work of gangs! And you can be damn sure that it ain’t Dipper or GPC party supporters behind this. Kick pretty boy Polievre OUT!